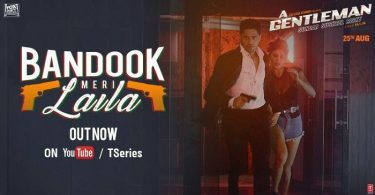 The Bandook Meri Laila lyrics from ‘A Gentleman’, featuring Sidharth Malhotra and Jacqueline Fernandez in the lead. Directed by Krishna DK and Raj Nidimoru, the music has been composed by Sachin- Jigar. The lyrics of Bandook Meri Laila has been penned by Vayu. The song has been sung by Ash King, Jigar Saraiya, Feat Raftaar and Sidharth Malhotra. If there are any mistakes in the Bandook Meri Laila Lyrics from A Gentleman, please let us know by submitting the corrections in the comments section.